The ‘Tru Plant’ Witches travel to the West Midlands to face the Wolverhampton Wolves at Monmore Green on Monday 29th April in a Premiership fixture that starts at 7.30pm. The Witches are back in league action on Monday night as they take on Wolverhampton at Monmore Green. Ipswich were in Supporters Cup action last week against Swindon, losing at the Abbey before beating the Robins 48-42 at Foxhall last Thursday. The Suffolk side have one win from one in the league though having beaten the Belle Vue Aces at Foxhall in their Premiership opener. Cameron Heeps returns to a track he knows well having started last season with Wolves and he will be out to prove a point after he was dropped by the club midway through the last season. 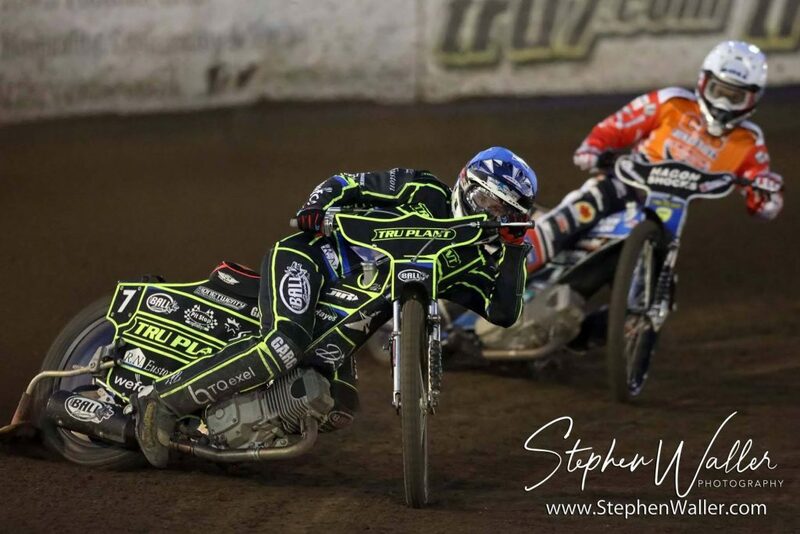 The tight Monmore Green track will be a test for the Witches, but all seven riders have experience there including Krystian Pieszczek who scored nine points on his first visit there with Leicester last season. The Polish rider moves to the number five spot for this clash as team manager Ritchie Hawkins moves the riding order around. Richard Lawson moves to number two, Danny King goes to number five and David Bellego goes to number four. Ipswich number one Chris Harris won British titles at the track in 2007 and 2010 and with the reserve Jake Allen in phenomenal form after scoring 16 points last time out, the Witches will be hoping to bring back some points to Suffolk. “I think Wolves are a very strong team on paper, so it will be a tough one. If we can go there and click then we will be looking to win the meeting, why not? “I have changed the riding order and changed the combinations a little bit. The 15-heat format in the league suits us better than the 13-heat cup format, so with the change around hopefully the boys will click. There is nothing wrong with changing things and seeing how they work. 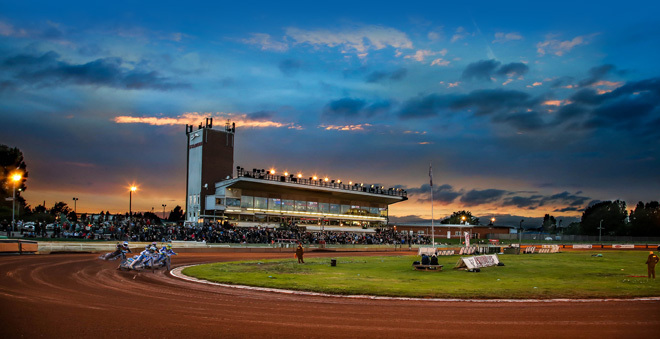 Wolverhampton as always are tipped to compete for the Premiership title in 2019, having surprisingly missed out on the play-offs last season. They missed out on the title in 2017 by a point as they were beaten by Swindon in the Grand Final as they attempted to retain their title they won in 2016. Wolves started their league campaign with a narrow 46-44 win over Swindon which will give the Witches hope of a positive result on Monday. Former Witch Rory Schlein captains the home team and he is joined by fellow Australian Sam Masters. Masters has been with Wolves for four seasons as he has grown into the number one spot. Ipswich legend Scott Nicholls rides at three, having come in for Jacob Thorssell who suffered an injury before the season began. The hosts will run rider replacement for Nick Morris at four who is out injured. 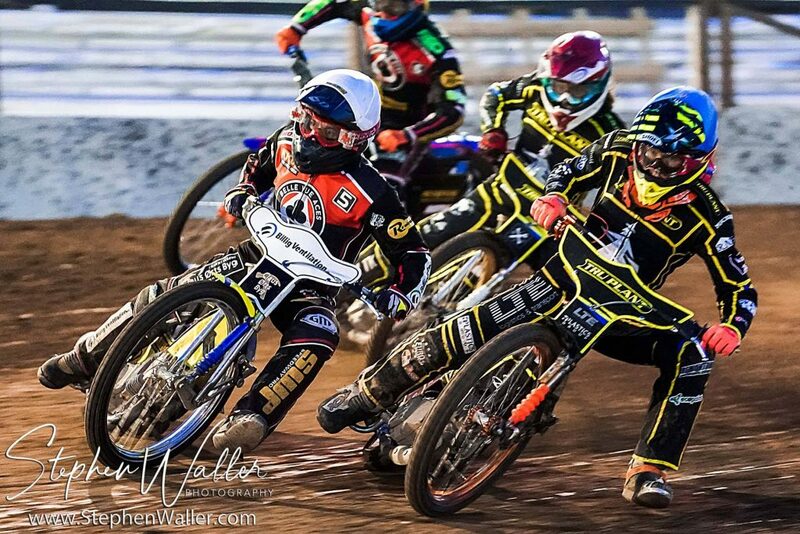 Wolves ride in black and orange kevlars and race at Monmore Green. The track measures at 264 metres with the track record belonging to Niels-Kristian Iversen who set a time of 52.69 in August of 2016. An adult ticket costs £18, concessions £14, juniors (aged 13-18 inc) £7, children (aged 6-12 inc) £1 and children under the age of 5 go free. For travel information head here. For more information about the club head to Wolverhampton’s official website. King’s Lynn drew 45-45 away at Peterborough in the Premiership. 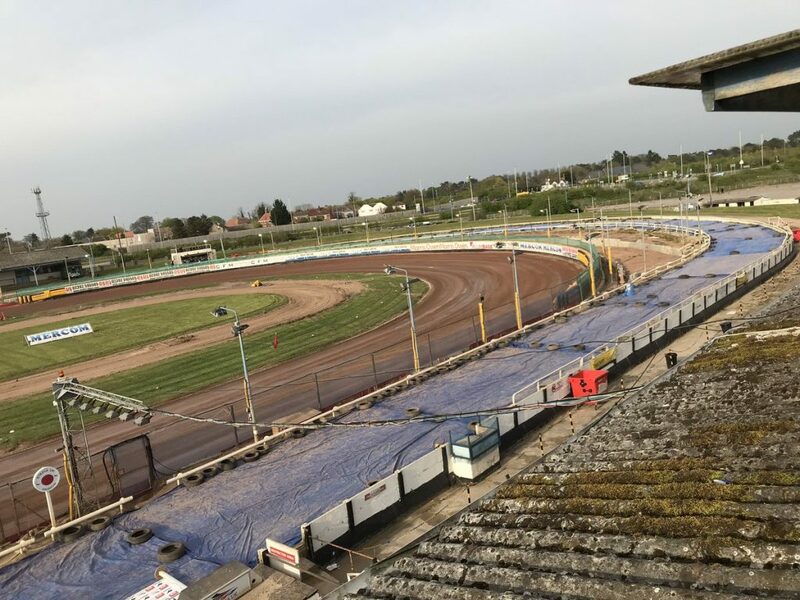 Belle Vue secured their place in the Premiership Supporters Cup final with a 54-36 win over Wolves last Monday afternoon at the National Speedway Stadium. The pair met again later that day at Monmore Green with Wolves running out 52-38 winners. Swindon beat Ipswich 51-39 in their Supporters Cup group last Monday before the pair met again on Thursday at Foxhall with the Witches running out 48-42 winners. ‘Tru Plant’ Witches team manager Ritchie Hawkins felt his side were always in control of the meeting as they beat the Swindon Robins 48-42 in the Premiership Supporters Cup on Thursday at Foxhall. The hosts were ahead throughout the meeting, but the Robins rallied late on to claim a consolation point that strengthens their lead at the top of the group table. Hawkins says the group is now out of their hands but says the signs are positive for the Witches heading into the league campaign. “It was another win, so I am really happy with that,” said Hawkins. “I felt we always looked comfortable and were always going to win the meeting. It is a bit disappointing to let them get a point that puts them in a very strong position in the group. The boss was delighted with the contribution from Jake Allen who scored 16 points from reserve and beat 2017 world champion Jason Doyle in one race. The boss explained that captain Danny King suffered several bike issues during the meeting and will be working hard to get things right for Monday away at Wolverhampton. The former skipper says that with the reserves riding so well it is tough on some riders to be lose a ride but believes there is plenty more to come from the team as they continue to gel. The ‘Tru Plant’ Witches beat the Swindon Robins 48-42 at Foxhall on Thursday night in the Supporters Cup as the away side claimed a consolation point. The Witches lead throughout the meeting and never looked like losing but the visitors didn’t let the Witches out of their sight and struck late to claim a vital point on the road to consolidate their position at the top of the group. Jake Allen was the star man on the night scoring 16 from reserve. Jason Doyle won heat one comfortably but David Bellego and Chris Harris both passed Dawid Lampart for a 3-3. Allen and Cameron Heeps then raced to a 5-1 in heat two as the pair continued their strong partnership at reserve. Heeps was back out in heat three as he replaced Krystian Pieszczek after the Polish rider went through the tapes. The second attempt at heat three was also unsatisfactory with Adam Ellis warned for moving at the start. Richard Lawson was the winner when the heat did get going and Ellis came second after fending off Heeps in third. That 4-2 to the Witches put them 12-6 up after three heats. Heat four was eventful as Allen won a shared race but it could have been a heat advantage to the home team. Troy Batchelor was in second for the Robins but got out of shape on the third lap allowing Danny King into second, but the Ipswich captain then fell due to machinery issues and was excluded with a 3-3 awarded. Doyle was a convincing winner again in heat five in another shared heat. The 3-3’s continued in heat six as Batchelor won ahead of Harris and Bellego leaving the hosts 21-15 up. The shared heats kept on coming as Tobias Musielak held off King for the win in heat seven. Allen was enjoying a brilliant night as he reeled off another win in heat eight ahead of Lampart as Bellego picked up third for a 4-2 to Ipswich. Pieszczek won heat nine after a tough battle with Batchelor, who was not happy after the race and with Lawson taking third it was a Witches 4-2 to put them 32-22 ahead. Allen replaced Bellego in heat 10 but it was Musielak who won for the visitors ahead of the Witches reserve and Ellis took third for a Swindon 4-2. Allen produced a stunning ride to win heat 11 as he beat 2017 world champion Doyle and King passed Lampart for third for a Witches heat advantage. Harris won heat 12 in a shared heat with the Witches closing in on victory, leading 41-31. Allen replaced King in heat 13 but he couldn’t beat Doyle this time as the Robins captain took the chequered flag but with Allen and Lawson behind him, it was a 3-3 that confirmed victory for the home team. The fans voted in man of the night Allen and Pieszczek to represent the Witches in heat 14 whilst Doyle and Ellis won the vote for the Robins. The penultimate heat of the night went the way of the visitors as they raced to a 5-1 that kept them in the hunt for a consolation point going into heat 15. The Robins did claim a consolation point after Musielak beat Lawson and Harris in heat 15, making the final score 48-42 to Ipswich. An easy decision with this one – Jake Allen. The Witches reserves have started the season on fire and this week it was Allen’s time to shine. The reserve racked up 16 points and even beat the 2017 world champion Doyle in one race. It perhaps wasn’t decisive but heat 11 was a heat that Allen and many Witches fans will say was their highlight of the night. It’s not often a reserve beats a former world champion, but the Ipswich man did just that with a fabulous ride and with his partner King passing Lampart for third, the Witches 4-2 edged them closer to victory. The Witches add three points to their name in the group as the Robins add one point after this close contest. That leaves Swindon top of the group on nine points with the Witches on second with six points, both sides have two meetings remaining in the group stage, with only top spot progressing to the final. The ‘Tru Plant’ Witches face Wolverhampton Wolves at Monmore Green on Monday 29th April in a Premiership fixture. The ‘Tru Plant’ Witches host the Swindon Robins at Foxhall Stadium on Thursday 25th April in a Premiership Supporters Cup clash that starts at 7.30pm. 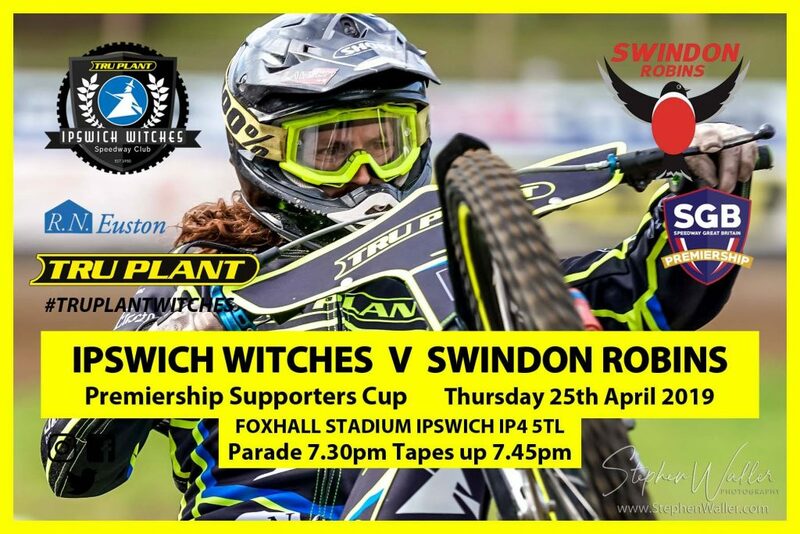 The Witches continue their Supporters Cup campaign with a crucial meeting against Swindon at Foxhall. Ipswich are now halfway through their group games in the competition, having won one and lost two so far and have no margin for error this Thursday against the leaders if they are to keep their cup hopes alive. The Witches hammered King’s Lynn at Foxhall but have suffered defeats on the road at both King’s Lynn and Swindon so far in the group. Ipswich sit second in the group, five points behind the Robins with both sides having three meetings left to race. 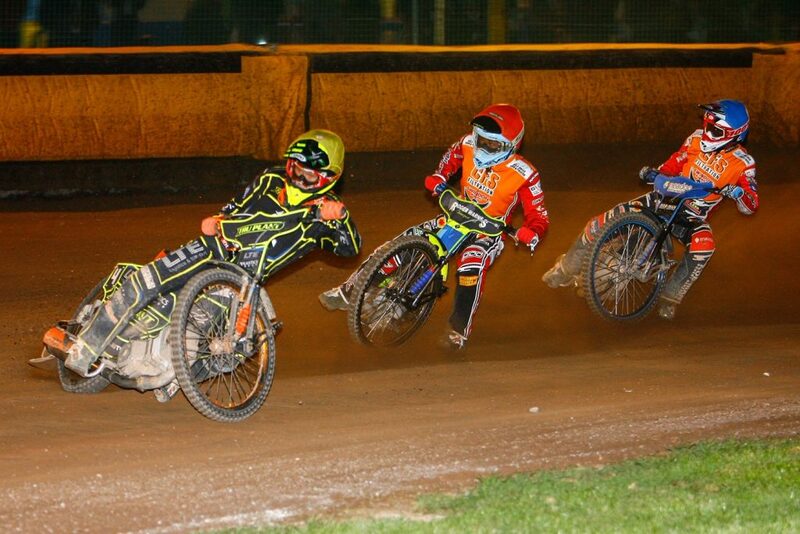 The two sides met at the Abbey on Monday night with the Robins running out 51-39 winners. Chris Harris returned from injury in fantastic form scoring 12+1 and his inclusion is a real boost to the team and fans who have taken to his entertaining style straight away. The Ipswich reserves Cameron Heeps and Jake Allen have been in stunning form so far in 2019 and with both being able to take seven rides, they are a threat to any team in the division and could be the difference on Thursday. 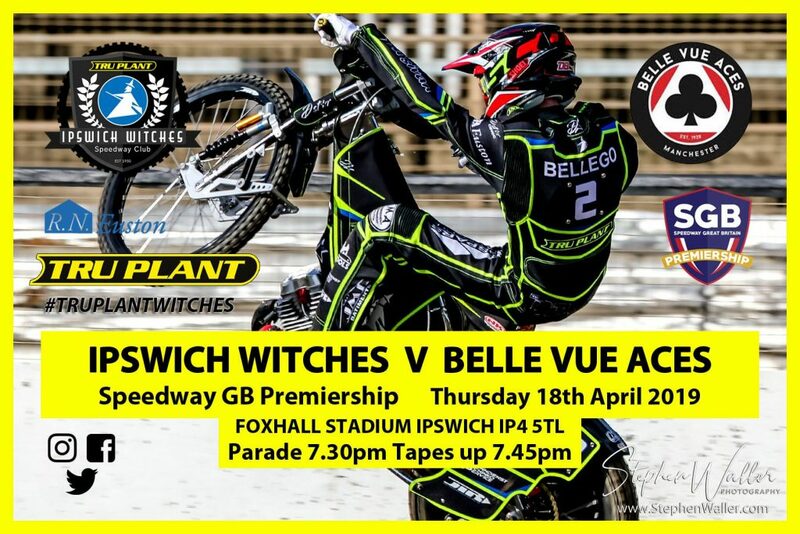 The Witches know that nothing but a win will do and they will be keen to ensure the Robins go away from Suffolk pointless as the race for top spot heats up. Fans are reminded that the Witches riders for heat 14 will be chosen by them. Look out for the Twitter poll on our official account after heat 10, you have 15 minutes to cast your vote for the Witch you want to see in heat 14 and the top two in the poll will be the riders that compete in the heat. The two riders chosen in heat 14 will not be permitted to take part in heat 15. “I want another good performance from the team, that is as valuable as anything at this point in time and then we will see how the group stands afterwards. “We are going to need to ride like we have done in the last two weeks because they are a very good team. If we carry on how we have been going then I am confident of getting the win. It is going to be a tough test and we will need to be on our game. This is top flight speedway there will be no easy nights. Hopefully everyone will come out and support us because the crowd has been brilliant so far this season and it is really appreciated, and they can really make a difference. Swindon have started the season strongly and if their early form is anything to go by they will be challenging on all fronts in 2019. They have only raced one league meeting but picked up a point at Wolverhampton after a 46-44 defeat. They sit top of the Supporters Cup group and know that any points picked up at Ipswich will strengthen their position further and enhance their chances of progression. They perhaps would have felt they were up against it in the group after their opening home meeting against Poole ended in a draw but having thumped the Pirates at Wimborne Road and backed it up with a home victory over Ipswich they now sit in pole position to meet Belle Vue in the final. 2017 world champion Jason Doyle captains the side and it is a rare chance for Witches fans to see a current Grand Prix rider taking to the shale in Suffolk. Doyle is undoubtedly one of the world’s top riders and the Witches riders will be keen to showcase their talents on home shale against the Australian which should lead to some entertaining action. Troy Batchelor is another rider with Grand Prix experience in the Robins’ ranks and former Witch Adam Ellis returns to a track he knows well having worn the Witch for two seasons at the start of his career. The 2017 Premiership champions are managed by Team Great Britain manager Alun Rossiter. Belle Vue secured their place in the Premiership Supporters Cup final with a 54-36 win over Wolves on Monday afternoon at the National Speedway Stadium. The pair met again later that day at Monmore Green with Wolves running out 52-38 winners. Swindon beat Ipswich 51-39 in the other Premiership Supporters Cup group on Monday. ‘Tru Plant’ Witches team manager Ritchie Hawkins says he feels optimistic despite seeing his side lose 51-39 at Swindon on Monday night in the Premiership Supporters Cup. 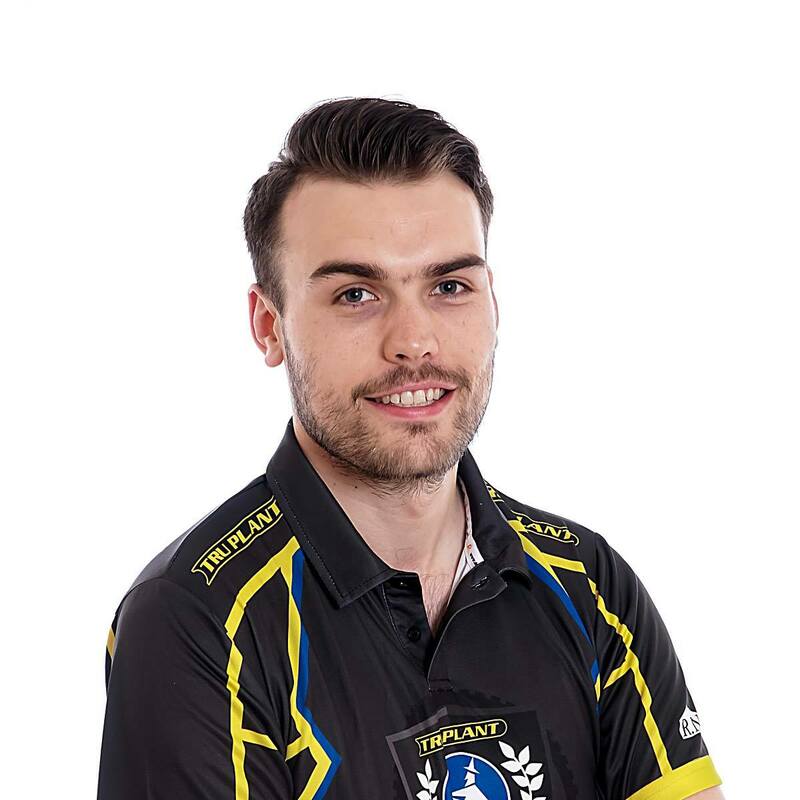 The Suffolk side were competitive throughout the meeting and were within reach of a positive result right up until the conclusion of heat 15 and Hawkins believes his team were not far off on the night. “We were not far off getting a good result,” said Hawkins. “The vast majority of our riders will think they should have scored a few more points and we have thrown a few away here and there too. At this level that is crucial, they are small mistakes that we will iron out, but it is still early days and there is nothing to worry about. I go away feeling quite optimistic. Chris Harris returned from injury to score 12+1 and Krystian Pieszczek caught the eye once again scoring 7+1 and Hawkins was pleased with their performances. It was the first visit to the newly shaped Abbey track for the Witches and the boss believes the surface will get even better with time. 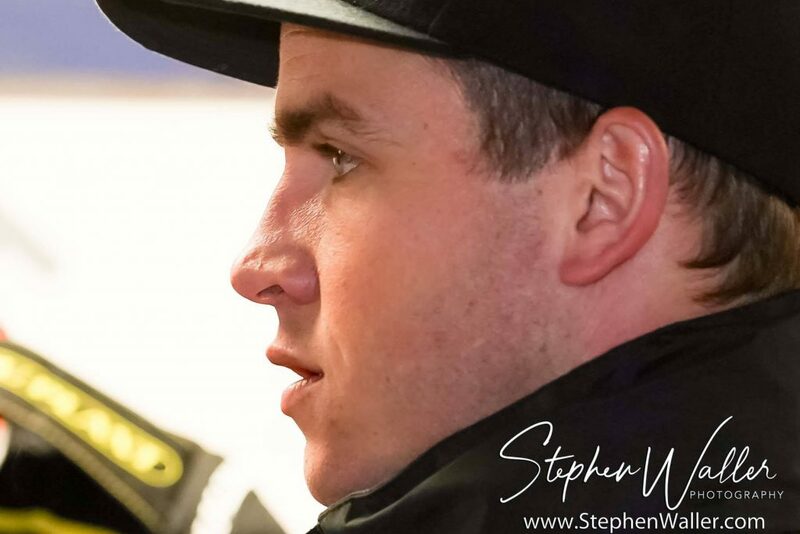 The result leaves the Robins in a commanding position at the top of the group, but Hawkins says he is not thinking about the group table until the conclusion of Thursday night’s meeting at Foxhall. 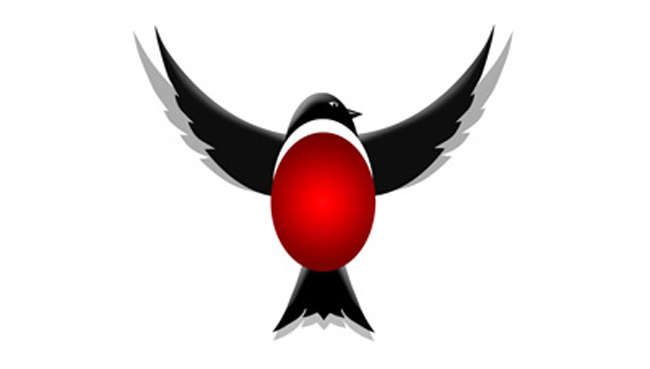 The ‘Tru Plant’ Witches were beaten 51-39 by the Swindon Robins on Monday evening at the Abbey Stadium in the Premiership Supporters Cup. The visitors were never too far behind throughout the meeting and kept themselves in with a chance of taking a point from the match, but the home side proved too strong in the end took three points to strengthen their position at the top of the group and deny the Witches any points on the road. Chris Harris top scored for the Witches on his return from injury with 12+1. The night started badly for the Witches as Jason Doyle and Dawid Lampart raced to a 5-1 in heat one with Doyle breaking the track record for the new Abbey track. The away side wasted no time in hitting back though and recorded their own 5-1 in heat two thanks to Cameron Heeps and Jake Allen. Heat three had to be re-run as Krystian Pieszczek went through the tapes and was excluded with Heeps coming in as his replacement. The re-run went the way of the Robins as Tobias Musielak and Adam Ellis reeled off the third 5-1 of the night to leave the home side 11-7 up. Troy Batchelor won heat four, but Allen managed to split the Robins pair as he rounded Zach Wajtknecht at the end of the first lap, meaning a 4-2 to the hosts. Ipswich number one Harris took the win in heat five, but David Bellego finished at the back, meaning a shared heat. Heeps claimed a fantastic win in heat six as he held off 2017 world champion Doyle. Doyle had made his way through traffic and set his sights on the Witches reserve but Heeps held firm to keep the Robins captain behind him and secure a 3-3 that left the hosts 21-15 ahead. Batchelor won heat seven but Richard Lawson and Pieszczek ensured it was a shared heat. Lampart won heat eight ahead of Allen and with Bellego retiring at the back it meant a heat advantage to the Robins. Heat nine was stopped as Musielak went through the tapes this time and he went from 15 metres in the re-run. Danny King got his first win of the night in the re-run but Heeps was passed by both home riders for a 3-3 that left Swindon 31-23 up. Heat 10 was also stopped as Lampart was warned for moving at the start but that didn’t affect him as he came out and won the re-run ahead of Pieszczek and Doyle passed Lawson for third for a Robins 4-2. Allen replaced Bellego in heat 11 but it was the home duo of Batchelor and James Shanes that made the gate. The Witches pair of Harris and Allen quickly went by Shanes and Harris produced a great move to pass Batchelor on the second lap and take the win to give the away side a 4-2. It was looking good early on for the Witches in heat 12 as King and Lawson led but Doyle swooped past both riders at the end of the second lap to win and Ellis passed King for second to give them a 5-1 that put them on the brink of victory and 42-30 up. However, the Witches kept themselves alive with a 5-1 in heat 13 thanks to Pieszczek and Harris. The fans voted in Heeps and Harris to represent the Witches in heat 14 with Lampart and Musielak coming out for Swindon. Harris duly won for the Witches but Heeps couldn’t get amongst the points meaning a 3-3 that confirmed the win for the home side. The hosts ensured the away side went home empty-handed as they recorded a 5-1 in heat 15 thanks to Doyle and Batchelor to make the final score 51-39 to the Robins. Just under a week ago, Harris underwent surgery on his scaphoid, but he returned to action in fantastic style scoring 12+1 for the Witches, keeping the Witches competitive at the top end of the team. Going into heat 12 the Witches were just eight points behind and in with a chance of taking something from the meeting. King and Lawson started heat 12 well and looked good for a 5-1 or a 4-2 but the home duo of Doyle and Ellis turned the heat on its head and scored a 5-1 for the Robins that all but won the meeting for the home team. The Robins collect three points and the Witches take nothing from this meeting. That puts the Robins five points clear at the top of the table and in a strong position to progress. The Witches must beat Swindon on Thursday at Foxhall and are likely to need some points on the road in their away meeting against Poole in the group. The ‘Tru Plant’ Witches host the Swindon Robins at Foxhall on Thursday 25th April in a Premiership Supporters Cup fixture. The ‘Tru Plant’ Witches travel to Wiltshire to face the Swindon Robins at the Abbey Stadium on Monday 22nd April in a Premiership Supporters Cup clash that starts at 7.30pm. The Witches continue their Supporters Cup campaign against the Swindon Robins on Monday in their third meeting of the group stage. Ipswich have one win and one defeat to their name so far in the group having heavily beaten King’s Lynn at Foxhall before being defeated on the road in Norfolk. The Witches raced to a convincing win against the Belle Vue Aces in the Premiership last Thursday, but attentions now turn back to the cup competition. Ipswich will be hoping to have number one Chris Harris back in the side. 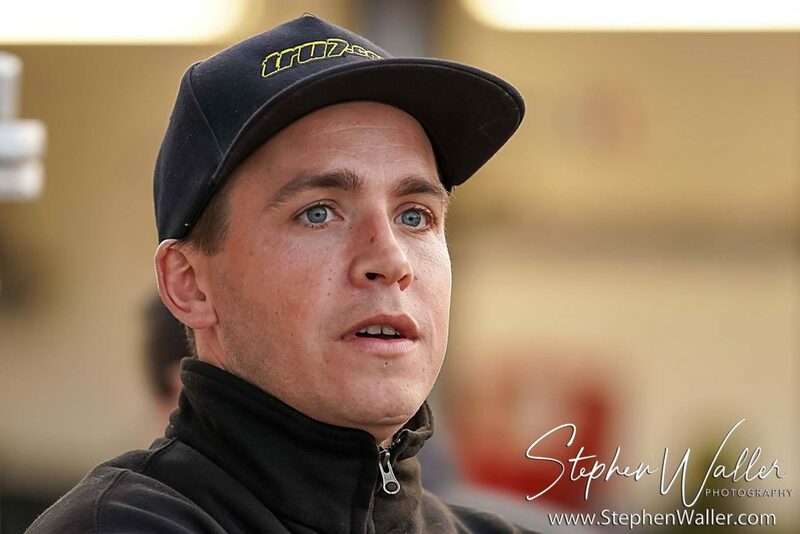 The Cornishman missed last Thursday’s win, having had an operation on his scaphoid last Tuesday following the crash he suffered whilst riding for Somerset in the Championship. ‘Bomber’ will face a late fitness test ahead of the meeting. David Bellego returns to a club he knows well having spent the last two seasons with Swindon and he will be hoping to use some of his track knowledge despite the track having undergone major changes this winter. The Witches will see Monday as a chance to pick up some vital points on the road in the race for top spot and will be hoping the Robins do not totally feel at home on their new track just yet. Fans are reminded that the Witches riders for heat 14 will be chosen by them. Look out for the Twitter poll on our official account after heat 10, you have 15 minutes to cast your vote for the Witch you want to see in heat 14 and the top two in the poll will be the riders that compete in the heat. The two riders chosen in heat 14 will not be permitted to take part in heat 15. “We are kind of going into the unknown a bit with them having changed the track a bit and I think there have been a few issues there. They had a meeting on Thursday so will be a little more dialled in than us at the start of the meeting, but we need to perform solidly like we did last Thursday and it’s an opportunity for us. “Chris may be fit for Monday, but we will know more in the coming days. “Half the track has changed now at Swindon, so it will be different. David has done well for us, I have no complaints with him. There is no expectation on him because it’s against his old club Swindon and no extra pressure. I know what he is capable of and he should be good for us on Monday. Swindon will be looking to improve on their 2018 season having missed out on the play-offs last time out. The Robins were crowned champions in 2017 and they will be looking to return to the top of the tree in 2019. In a bid to do so, they have brought back 2017 world champion Jason Doyle to the Abbey to lead the side this campaign and he is the only Grand Prix rider to be riding in England this season and the Australian will undoubtedly be a hard man to beat on any track this year. Doyle is joined by compatriot Troy Batchelor who has bags of experience at World Cup and Grand Prix level and has spent many seasons in Wiltshire. Former Witch Adam Ellis has made Swindon his home in recent years and will be a threat in the middle order. There has been major track work over the winter at the Abbey as they have reduced the size of their track in a bid to improve the quality of racing. 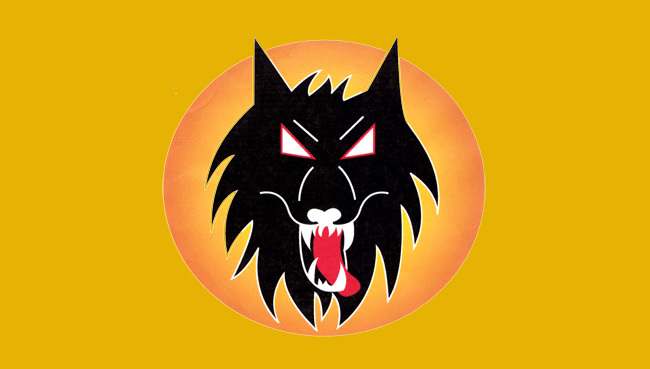 The Robins picked up a Premiership league point at Wolves after a narrow 46-44 defeat last Monday but were held at home in the Supporters Cup last Thursday after a 45-45 draw with Poole. However, they stormed to a big away win against the Pirates on Good Friday to put them top of the group and in the driving seat. 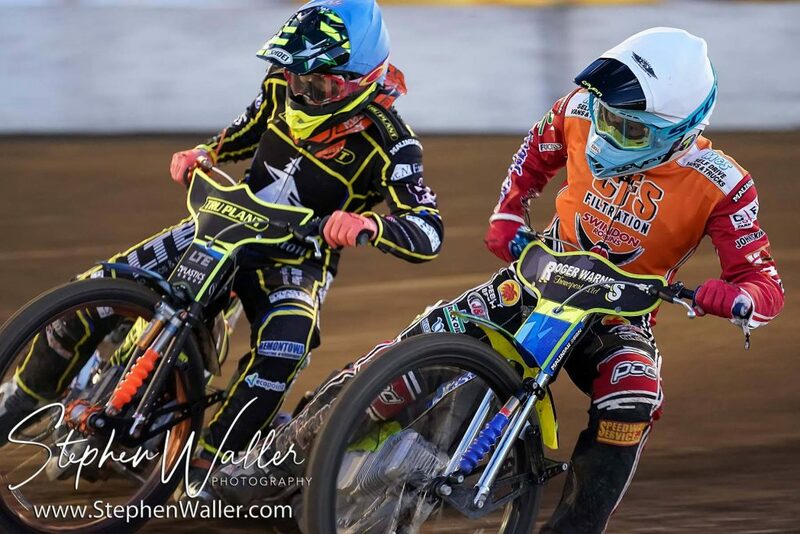 Swindon ride in red and orange kevlars with white and black and race at the Abbey Stadium. The track measures at 320 metres with the track record belonging to Brady Kurtz who set a time of 62.23 in April of 2019. An adult ticket costs £18, concessions £15, children (aged 11-16) £5 and children under the age of 11 go free. For travel information head here. For more information about the club head to Swindon’s official website. Ipswich beat Belle Vue 52-38 in the Premiership at Foxhall last Thursday. Poole drew 45-45 away at Swindon in the Supporters Cup as the Pirates picked up two valuable away points, leaving the Robins with just one point. The two sides met again on Good Friday in the same competition with the Robins claiming four points after a 53-37 win in Dorset. 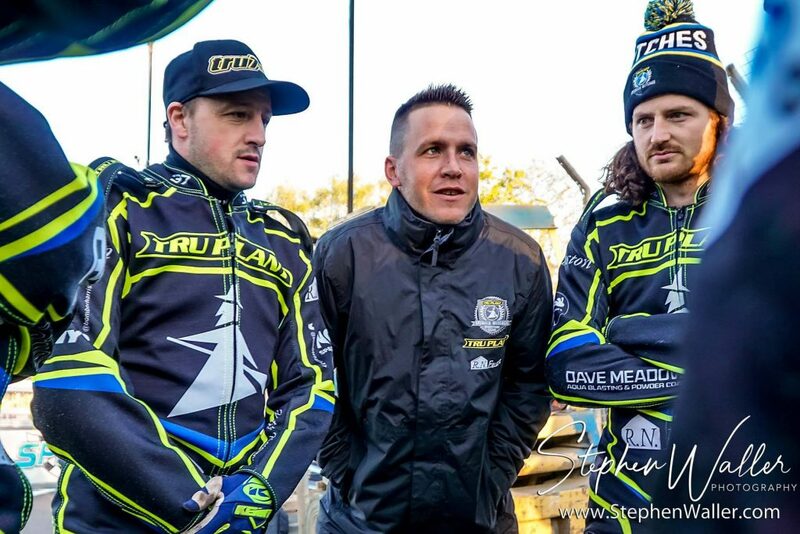 ‘Tru Plant’ Witches team manager Ritchie Hawkins was delighted with his side’s performance as they beat the Belle Vue Aces 52-38 in the Premiership on Thursday night at Foxhall. The Witches were in fantastic form as they collected three league points in their first meeting back in the top flight against one of the sides tipped for silverware in 2019. Hawkins was pleased to see every rider contribute to the victory. “I really am delighted, all seven contributed well and it was a very solid team performance,” said Hawkins. “I can still see plenty of improvement too, especially from the new guys. The result did not surprise me, I already have such confidence in the team around Foxhall and I am very happy. The boss believes that despite the impressive win, things will get even better, and he was pleased to see Richard Lawson back to his best as he scored 11+2. Cameron Heeps top scored again from reserve with 12+1 and wowed the fans winning a titanic battle for second against Australian champion Max Fricke in heat 11 and Hawkins believes there is a lot of positivity at the club at present. The ‘Tru Plant’ Witches opened their Premiership campaign with a dominant 52-38 victory over the Belle Vue Aces on Thursday night at Foxhall. Despite an opening heat 5-1 to the visitors it was the Witches who controlled the meeting as they got the bulk of the work done early on, building up a 12-point advantage by heat eight. The hosts added to that lead and saw the meeting out in comfortable fashion to start their league season in the best way possible. Cameron Heeps was once again the top Witch scoring 12+1 from reserve. The away side gated in heat one as Max Fricke and Steve Worrall coasted to a 5-1 and it looked like being a tough night for the Suffolk side. However, the home side hit back immediately in heat two as Heeps and Jake Allen levelled the scores with a maximum heat advantage. There was a third 5-1 in heat three and it went the way of the Witches again as Krystian Pieszczek and Richard Lawson were quickest out of the gate and couldn’t be caught, giving the Witches an 11-7 lead. It looked like being yet another Witches 5-1 in heat four as Danny King and Allen made the gate, but Kenneth Bjerre split the pair by passing the Australian reserve on the second lap, meaning a 4-2 to Ipswich. Lawson won heat five ahead of Fricke and Pieszczek made his way into third with an impressive pass on Worrall coming out of the second turn on the second lap to give the home team another heat advantage. Bjerre won his first heat of the night in heat six by some distance as the points were shared, leaving the Witches 22-14 up. The 5-1’s were back in heat seven as King and Heeps cruised to a maximum to extend the home side’s lead. Worrall was the winner in heat eight but with David Bellego and Allen both in the points the Aces could not claw any points back. Bjerre was looking quick and won again in heat nine as he beat Pieszczek and Lawson in a shared heat that left the Witches leading 33-21. It looked like game over for the away side following heat 10 as Heeps came in to replace Bellego and went on to team up with Ipswich guest Rory Schlein for another 5-1 to put them 16 points ahead. Heat 11 was won by Worrall, but it was the fight for second that will live long in the memory. Fricke held second early on for the Aces but Heeps had other ideas. The Aussie duo would go on to pass and re-pass each other countless times throughout the heat, going bar to bar down the straights in an epic battle. Heeps finally made it stick to take second ahead of the Australian champion and although that meant a 4-2 to the Aces the Foxhall fans were on their feet to applaud their man’s efforts. The Witches confirmed their victory in heat 12, Bjerre came in as a tactical substitute and won again for the away side but Lawson and Heeps, who had come in for Allen, both went by Dimitri Berge for a 3-3 that made the score 43-29 with three to race. Bjerre was in fine form and won again in heat 13 but Schlein and King were both in the points for a share of the spoils. Ricky Wells won heat 14 ahead of Pieszczek and Allen as the run of 3-3’s continued. 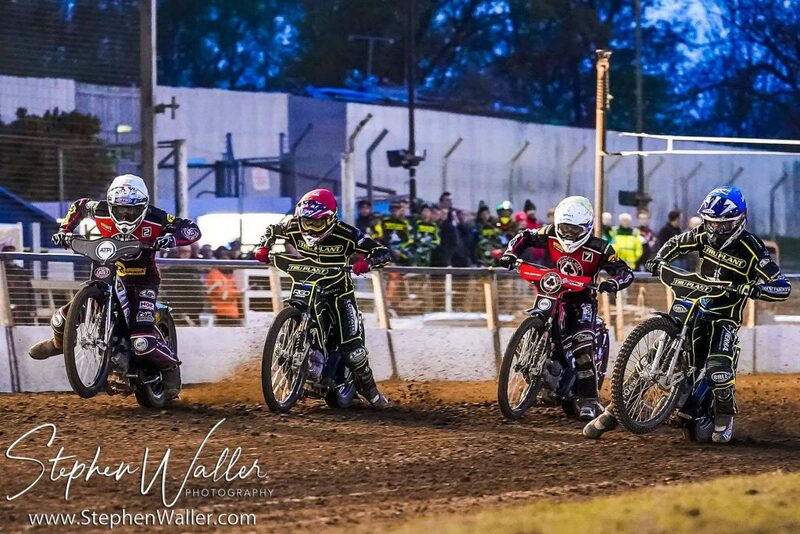 The night ended with another good race as Lawson held off Bjerre to win a shared heat that gave the Witches a 52-38 win and three Premiership points. It seems like we could just copy and paste this at the moment, but it was Heeps who once again caught the eye. The Australian reserve has started the season in stunning form and scored 12+1 from six rides and provided the highlight of the night, winning his battle for second against Fricke in a fantastic race in heat 11. It may seem strange to pick a 4-2 to the Aces as a key moment but heat 11 was one to remember. The Witches were 16 points ahead going into the heat, which Worrall won for the away side. However, the fight for second was a joy to watch. Fricke held second early on and a 5-1 to the Aces could have given them confidence to mount a fightback but the man of the moment Heeps wasn’t to be denied. The Witches man and the Aces number one threw their bikes at each other for four laps in one of the best heats seen at Foxhall for some time. Heeps came out on top to the delight of the home fans and it showed that it would take something special to deny a Witches win on the night. The Witches pick up three league points that puts them top of a very early league table on points difference. The Aces begin their league season with a defeat and are pointless after one meeting. The ‘Tru Plant’ Witches travel to the Abbey Stadium on Monday 22nd April to take on Swindon in a Premiership Supporters Cup clash. Poole claimed a 45-45 draw at Swindon on Thursday night in Ipswich’s Supporters Cup group. Click here for reaction from team manager Ritchie Hawkins.